Sometime last year I realized that 2019 will mark the 15th anniversary of my brain injury. No pun intended, but I've been having a hard time wrapping my brain around that fact! I decided that I would honor the anniversary with a special quilt. I love the idea of temperature quilts that so many fiber artists have made for years and when I noticed that Twiddle Tails was hosting a temperature quilt along, it was just the motivation I needed to get started. You can read about my initial ideas in my original post. As you can see from the photo above, January started strong as a new year always inspires me. But the last few days have been pretty rough with three gray days pointing down. Yesterday was particularly bad as my headache worsened into what I call electric headaches where it feels like I'm being shocked as I feel a current moving through the back of my brain. The only time I was up was when I went to get my mammogram. Pretty bad when that's the highlight of the day. I was home by noon and didn't get out til this morning. Today is my 47th birthday! Waking up to my boys singing happy birthday, giving me cards--D's was written in invisible ink!, receiving my gifts of a new dust buster and a pack of purple pens, and of course a flood of birthday wishes from Facebook friends around the world was just what I needed to give this headache the heave ho! MAYBE I can sew today, but first, I want to give an update of my quilt now that I'm two weeks into the project and have had time to working on the project. I am making one flying goose for each day. The wings will denote the daily low (right) and high (left). I have prints picked out in 10 degree (F) increments, which everything below 0 and above 100 included in the outlier colors. I live in Ohio where those extremes are rare. For consistencies sake, I am using weather underground for my daily temperatures at our local airport, regardless of whether I am home or not. The center triangles of the geese with indicate how my brain injury affected me that day. There are 7 options (slightly modified from my first post). Each brain injury is different. My brain injury affects my vision and causes headaches daily, the only difference is severity. When I am symptomatic (due to being in situations that cause my brain to flood, such as loud places, blinking lights, stress, lack of sleep, busy places, too much going on, multi-tasking etc. ), I am prone to aphasia (where the words I want to say don't come out right), stuttering, and an inability to take in information or respond. When I am symptomatic, Niels sends me to bed, makes sure the room is dark, gives me the meds I try to avoid, sprays peppermint everywhere, and makes me rest. He is a wonderful caretaker. D, newly 10, also recognizes the signs and knows when to send me to bed. He's a little overzealous at times because my bad brain days mean extra tech time for him! Dark Gray - arrow points down - Bad brain day. Primarily stayed in bed. New sewing or other household activities. Medium Gray - arrow points down - Painful day. Needed a nap, and not able to rally enough to sew. Light Gray - arrow points up - Didn't take a nap, but no time or energy to sew. Light Purple - arrow points down - Took a nap, but still able to sew a bit. Medium Purple - arrow points up - No nap, but was able to sew a bit. Dark Purple - arrow points up - No nap, and was able to sew at least four hours. A rare, really great day. Purple & Gray - arrow points down - Travel day. I may have napped or not, but I didn't sew because I wasn't home. For example, we will be going to the Netherlands to see my in-laws this summer. I know I won't sew while I'm there, and will have good and bad days, but it's a different animal than when I am home. In short, if I was able to sew, the arrow points up. If I don't sew, for whatever reason, the arrow points down. I also decided that if the only sewing I do is the five minutes to make my daily goose, that won't count as a sewing day because unless I'm feeling exceptionally bad, I can make that happen. As I've started this quilt, I'm also finishing the latest Bonnie Hunter Quiltville Mystery Quilt, Good Fortune. One of the tips I learned from heris to save the clipped triangles from my geese to make half square triangles. I can't believe I found all the little pieces in the tote when I had the idea nine days into the year! I'm thinking about using the HSTs to make chevrons for the border. Another idea would be to put all of the like colors together at the end of the year to show how many of each type of day I've had. I'm leaning towards that idea at the moment. I've sewed together the chevrons I have so far, but they can easily be undone because I've written each day on the back of each flying geese and HST chevron. Because I have the basic template for the quilt decided, I am sewing together each days block after I make it. The quilt will have 12 columns with the days of each month making up the rows. Each column is staggered to indicate the day of the weeks on which the month begins. January starts on a Tuesday, so there is a 4.5" square block at the top of the column. I also decided to set off the weekends with 1.5" x 4.5" strips because I want to see if there is a difference when my boys are around and we may or may not be out and about. The one thing I haven't quite figure out yet is how I want to indicate special days. Like today for example. I'm thinking I will either applique or hand stitch a 47 on today's center triangle. And the on the 21st is my big brain anniversary so I want to do something special there too. I have lots of special days, but I will limit to ones that affect my brain injury and quilting. So maybe I will find an icon to use when I finish a quilt. Any ideas? A few tools that are going to make this project go smoother. 1. Ultimate Flying Geese Tool. I bought this awhile ago and I am finally able to make perfect geese every time. 2. Craft Mallet. Not only is this a great tool for smoothing out thick seams, but it's also cheap therapy! 3. My chart! I keep this chart with my pre-cut fabric and color guides. I know that there will be times I get behind and between weather underground and this, I will be able to easily catch up. Follow along with the progress of this quilt on Instagram at #TBITempQuilt. I'd love the encouragement to keep me working on the rough days! You can use the hashtag #tempquiltalong to see what other quilters are doing. To see what I'm currently working on, follow me at deJongDreamHouse. Happy (slightly belated) birthday! 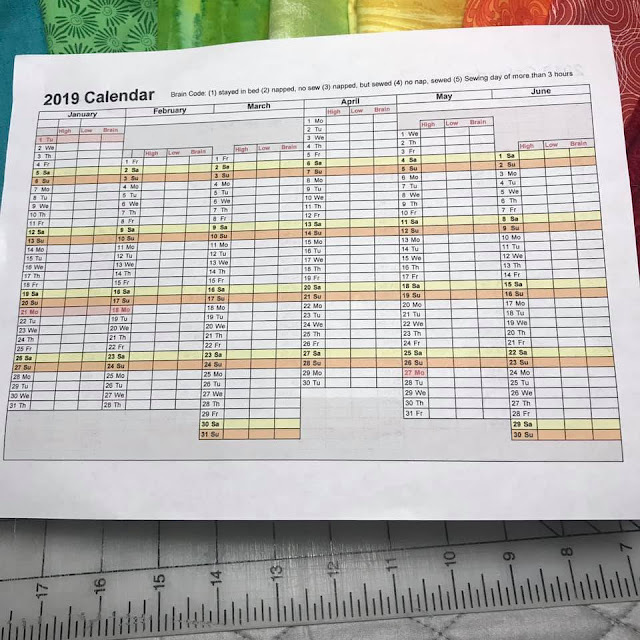 What a clever idea to integrate other daily "journal entries" with your temp quilt. I look forward to seeing how you decide to note the special occasions. Thanks for linking up to What I Made Monday! I have seen many temperature quilts and your quilt it the first one I love and want to copy!! Combining the temperatures with your brain health may lead you or your doctor to some new insights! Our connection to our environment and how it affects us is way more than we usually consider. I am a retired special ed teacher and I had a couple of students who had TBIs...one recovered enough to be excused from special ed and I lost touch with the other after he left my room. You are right, every TBI is so different in how it affects each person. Praying for way more up geese than down!! Thank you for a wonderful comment! And as the daughter of teachers, thank you for all you've done for your students. Teaching is not an easy career, but so so vital! What a fascinating temperature quilt. In a way it's internal and external temps! Having just found your endeavours tonight, it really caught my attention the way you are charting the weather patterns you are living in and to your health. I thought this would be a helpful way for my adult daughter to chart her own observations regarding her health issues. Without knowing anything about your TBI (I,like another poster worked with TBI students in the '90's and 2000's) I thought I'd share some information about my daughter who is also experiencing severe symptoms typical of TBI, but without the knowledge of an injury. She became symptomatic almost two years ago and those symptoms have become debilitating. She is only able to be in an upright position for very short periods of time before her symptoms become severe. Finally a diagnosis came about after many diagnostic tests: spontaneous cerebral-spinal fluid leak at the cervical spine juncture. I am mentioning this to you just because of the possibility that these can occur with a TBI but also can occur post-TBI without additional trauma. In fact my daughter has a connective tissue discrepancy that,(in my simple words), that these tissue connections can break/disintegrate/open/let loose or, as in her case, cause a leak in her spinal cord. This info is just an FYI, maybe something to look into? 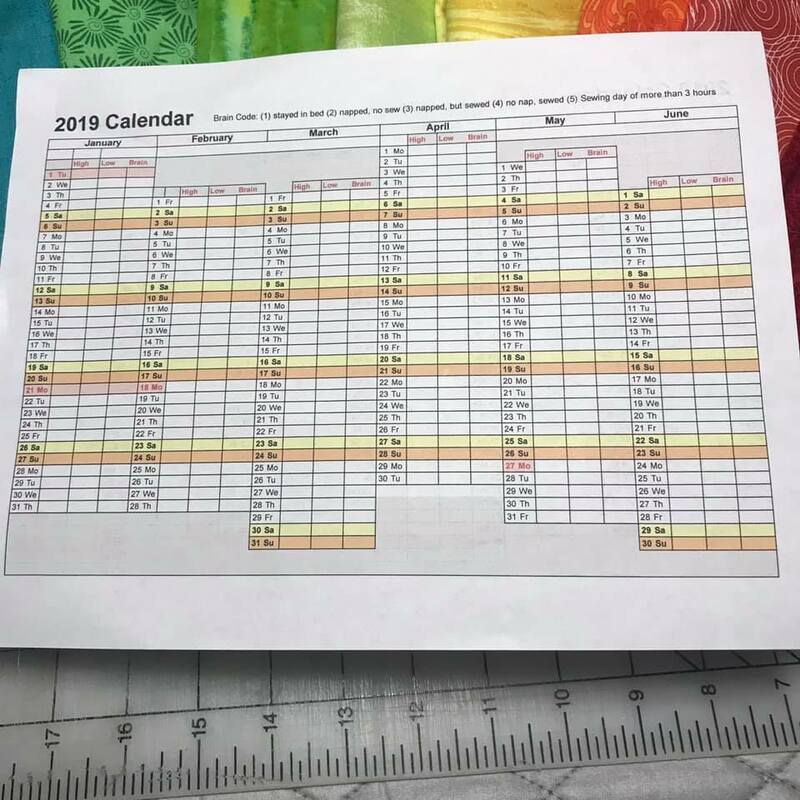 I'd like to thank you for this great idea of charting your days and giving a visual "voice" to the inner person so they may convey this to others. Peace to you, and Thank You. Wow! That must have been terrifying to experience without knowing the cause! I hope she is getting some relief and help know that she knows the cause! Your temperature quilt is off to a great start! Frankly, I favor the idea of laying them out in day order, rather than grouping like ones together. I think you might find it more informative, but also I think the quilt will be prettier that way. Happy birthday by the way! I'm so glad D and your husband were able to lift your spirits. Hang in there! Happy Belated Birthday! Your temperature quilt idea is really great. I like how you are able to incorporate other elements, besides just the highs and lows of the day, to get an idea of how you were feeling. I do hope that at the end of the year there are a lot more better days than not. 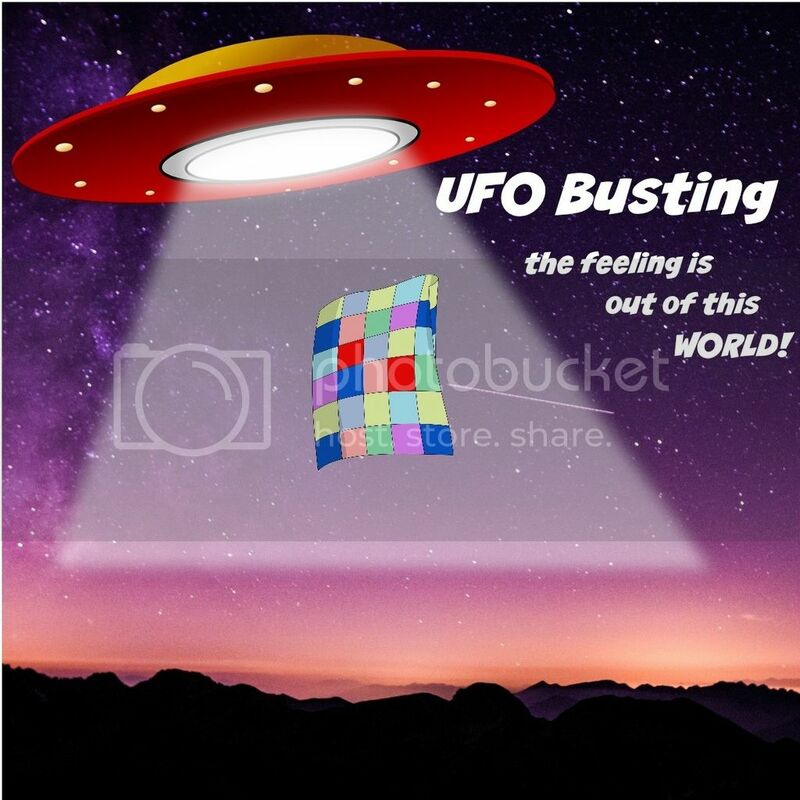 I found you through your share on sewcanshe. I love this quilt you are working on, I had never heard of this idea with the weather. I am close by in Michigan, so I know you will have plenty of variation through the year. I love your plan sketched out above, staying with the actual days, it just seems like such a great idea. I will be following your progress. I amin my 3rd year of what I call a Dance with a terminal cancer diagnosis. Some days nearest treatments I too spend in bed, but I am also blessed with days when I am able to do so much more, including quilting!! hoping your have lots of purple upward pointing days. by the way, I always use the little cut off half square triangles also, I can't immagine waisting them, haha.